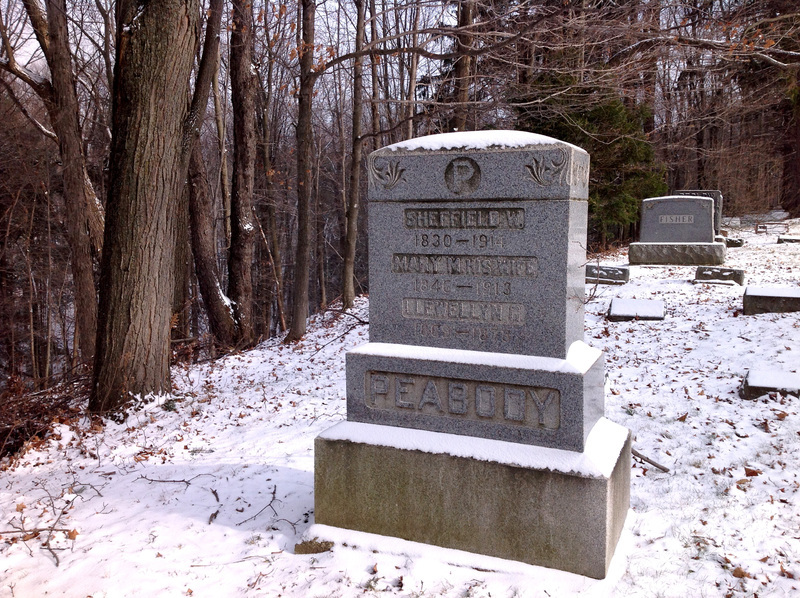 Sheffield Peabody is buried, along with his wife Mary and his son Llewellyn, at the Evergreen Cemetery in Springfield NY. On the back side of his monument is verse adapted from Thomas Jefferson's deathbed letter to his daughter, Martha Jefferson Randolph: "Farewell my dear family adieu / The last pangs of life is in parting with you / Two Seraphs await me, long shrouded in death / I will bear them your love in my last parting breath." Death, an inevitable part of life, was something that Sheffield Peabody witnessed many times. His diaries record the passing of others at all times of the year, yet by tradition winter is the season of our mortality—and it was common for him to mention the death of “Old Mr. Steward,” “Old Misses Higgins,” and “Granny McIntire” as if it were very natural. Whether someone was a close friend or not (“Liger Wetmore’s wife”), it seems that Sheffield records the events as an act of respect to those who had died: they were important people who were worth writing about, if only for a brief moment in one of the days in his journals. With every person’s passing, a funeral would take place within a couple of days because embalming was uncommon until later in the century. Care of the dead has become so professionalized—New York state law requires a funeral director to sign off at every stage—that it is difficult to envision how DIY it was during Sheffield’s time. The body of the deceased would be washed and changed into clean clothing. Younger people sometimes would “sit up with” the corpse overnight to ensure its integrity, and during the day family friends would stop by the home to pay their respects. Several times we can see that Sheffield has been called upon to transport the casket to a cemetery—for example, the one recorded as “Ball Hill” in his journal and now called “Bald Hill.” What all of this tells us is that his small community depended upon mutual aid during times of grief.